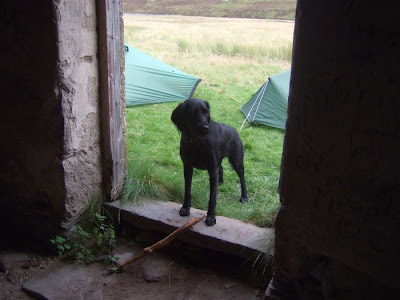 To recap on the camping - last weekend, me Paul, Gordy and the Wee Black Dug met at the carpark just north of Auchlean, about 6pm on Friday evening. We'd been held up a trifle by the roadworks on the A80 at Haggs, which are apparently to be there for the next two and a half years. I suspect I'll be able to factor the delays that they cause into my journey times shortly before they're finished. If you want photies of the trip, just look here. They're much better than mine, and cover the same ground. Plan for the first night was to walk in to Ruigh Aiteachain bothy, about an hour and a halfs' jaunt from the carpark. Couple of unexpected burn crossings were required, but we managed to arrive without noticeably wet feet. 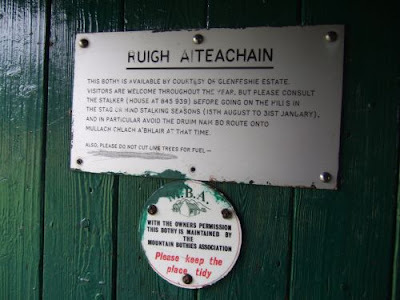 The bothy itself was fine. Two rooms, which was maybe just as well, as one of them was full of Young Persons, who didn't seem to be swearing, smoking or drinking as much as our party, so even although they had the room with the fireplace in it, the evening passed perfectly pleasantly and warmly enough. It got progressively wetter during the night. Gordy and Paul elected to kip on the sleeping platforms in the bothy, but me & Jorja headed out to the tent to avoid her sneaking about in the middle of the night, raiding rucksacks for cheesy comestibles. Plus, I had to blow up my new camping lilo, and I feared the sounds of my laboured asthmatic wheezing would put off the rest of the bothyers if I tried to inflate it indoors. None of your sensible user friendly self-inflating rubbish for me! It's pretty good, incidentally, although (and I know this sounds ridiculous) it took me a wee while to get out the habit of sticking my pillow/rolled up fleece beyond the top end of the mat rather than on top where it obviously should go. Too used to three quarter length mats, I suppose. Plus, when I wake up during the night in a tent I'm rarely firing on all comprehension cylinders. However, it's comfy and has enough support that you can actually sleep on your side, which I've hardly ever been able to do before with the Ridgerest or the Wee Airic. Saturday morning dawned bright and clear. Half an hour after dawn however, it was pishing it down. 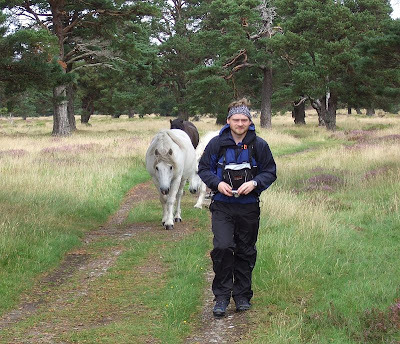 We set off about 10:30, heading south alongside the River Feshie. Wildlife central with eagles, horses and the Wee Black Dug. The cuddies clearly didny like the look of Gordy, and gently but firmly escorted him off their patch. The weather held up for a while, but there was gathering gloom behind us and after about two hours walking it was on the miserable side of fun. If we hadn't been quite so far from the cars, I reckon there was a fair chance that we'd have abandoned ship around then. We decided to give it half an hour and then stop and have some lunch. A bizarre rickety wooden bikeshed affair provided a wee bit of shelter and we sat down and had a salmon spread piece - I assume everyone eats salmon spread pieces while out walking - and a wee chat with a couple of brave mountain bikers who were travelling in the opposite direction. Each group assured the other that the worst of the trip was yet to come. The combination of the rest, the food and a noticeable improvement in the weather just after we set off again heightened spirits and we curved round eastwards heading to the bridge at the waterfalls on the River Eidart. If you were going to come up with a combination of sensory experiences that Jorja hates, you'd be hard pushed to better the collection that crossing involved. She could hear the roar of the water underneath and around her. She could see the water rushing below her through the open slats on the walkway. She could feel the gaps under her paws, which always causes her consternation. She knew fine that the waterfall was close to her on the right hand side, and she was pushing as hard to the left as she could. Meanwhile I'm hanging onto the handrail with my right hand and her collar with my left in a valiant effort to stop her coming off the bridge altogether through the 3 foot gap between the walkway and the handrail. And you know how much I like heights, so I'm sure my nervousness wasn't transmitting to the dug and making her feel worse. Next time I'm taking Gordy up on his offer to carry her across. Back on terra firma, the weather stayed kind and we continued east, eventually meeting up with the Geldie Burn. We were swithering by this time whether we should try and get to Linn of Dee that night, or whether it made more sense to find a camping spot on the way and get up early, in time to walk out to get our lift on Sunday morning - most kindly provided by Paul's faither! The fact that camping spaces are pretty restricted at Linn of Dee, and the fact that we found an official dangerous building on the way to White Bridge made up our minds for us. 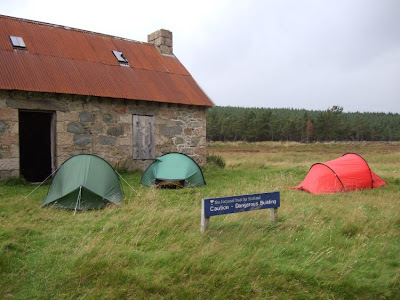 It was hardly luxurious, but there was plenty of shelter; some hard wooden planks to sit on; a blocked chimney which put paid to our attempts to light a cheering fire, and nae floor - just two foot of manky thick dust and a delicate covering of swallow shite over everything. The swallows were actually particularly cool. Maw, Paw and three weans. It seemed to be awful late in the season for youngsters still to be about if you ask me, but they all looked happy enough once Jorja moved away from the door with her stick and they could get in and out again. The fact that the Wee Black Dug was still anxious for folk to throw sticks for her was, I thought, quite impressive, given the distance that we'd walked that day. And needless to say, whatever distance we had covered, she must have done at least twice that. All three tents were put into service on Saturday night. It was reasonably early when we hit the sack, and as it turned out that was probably for the best. About half four there was the noise of a car rumbling up the glen, to be followed by a cheery shout that "it's the mountain rescue - we're looking for two overdue female walkers". Paul was in the tent nearest them, so he had to be the spokesman and explain the only folk we'd seen all day had been men on bikes. After that, given we were getting up at 6am to make the rendezvous there wisny much prospect of getting back to kip. Thankfully, about 20 minutes after we struck camp and set off in the morning we encountered the two women approaching the track to Linn of Dee from a different path. They looked reasonably well, if a wee bit shaken. As best we could work out they'd got caught out on the wrong path, with no torches and had reached the stage where they just had to try and find some sort of shelter for the night and hunker down. They had a wee Yorkshire terrier type dug with them, which looked a bit puppyish and which seemed awfy glad to get a share of Jorja's biscuits. In fairness, there was an empty MRT Landrover parked just at White Bridge, and the women were promptly picked up by another Landy which arrived up the glen about 5 minutes later, so you couldn't ask for a better organised set up. It was an enjoyable early morning walk out. Got to Linn of Dee about 8:45, duly picked up and chauffeured via Tomintoul and Aviemore back to Auchlean. Jorja must have been puggled, because she went to sleep curled up in the front footwell of Paul's dad's Mercedes. Comfier than the boot of the Subaru, no doubt. Me and Gordy stopped off in Kingussie for rather excellent bacon rolls and coffee from Pam's Coffee Shop. Sitting on the benches in the main street, the rural peace and tranquility was fractured only by hunners of hairy arsed bikers roaring past on their way home from Thunder in the Glens in Aviemore. Dropped Gordy off at his car which he'd left in Doune, and home mid afternoon. A good and long overdue camping reunion. One salutary note though. Guess how many ticks I've just removed from the Wee Black Dug? Seventeen. Oh, and the title? 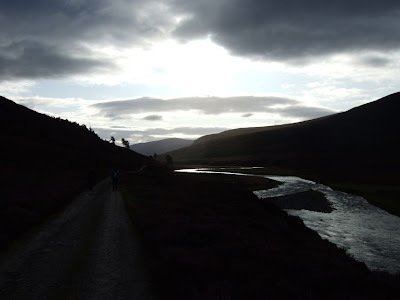 Well apart from the crossing at the Hideous Bridge of Doom, and a brief moment when we first saw the horses near the bothy, Jorja was unrestrained from about 7pm on Friday until 9am on Sunday. Dug heaven. Ah...the luxury of a one-way trip - something that never happens to me...sigh! I've never been to the Linn of Dee area yet but intend to have a couple of days walk in/walk out to climb some of the more southerly 'Gorms. Thoroughly enjoyed that Scott. How was WBD with the cuddies? She was good, Ken - surprisingly so. Mind you, I think they were probably just too big for her to want to get too close to. After that first encounter she was fine off the lead even when we came across another couple of pockets of them right beside the path. The Linn of Dee starting point is great for dugs, btw. The walk up towards Derry Lodge, the whole length of Glen Derry and the hills around it is one of my favourites if I'm taking both the dogs. Give us a heads up when you're going - I never need an excuse to go back. Will do Scott it's an area I've been looking forward to doing for a while. All I need is some sunshine, midge-free breeze and some blue sky and I'm off. If I get all three when I check mwis on any given Thursday (for a Sat/Sun walk)I'll give you a shout and see how you're fixed. It's a long walk in so it'll be interesting to see if I can get up the hill at the end...or not!